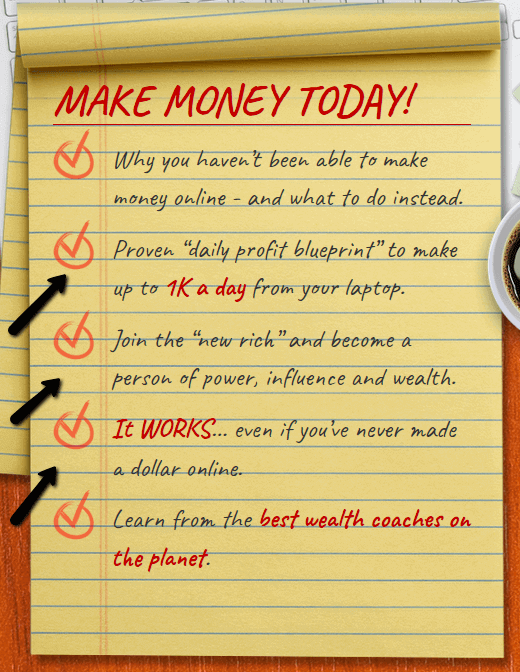 Is it possible to earn $1,000 a day using a secret system that you can easily set up? According to a program called Lazy Wealth System, it’s possible even if you don’t have prior experience in online marketing or have never made a dime online. If you’re one of the people who visited their sales page, then this claim may have caught your attention, but you want to know if this program can really deliver on their promise. This Lazy Wealth System review, will show you some of the essential info you need to know about this program to make an informed decision and know for yourself if this program is for you or not. In fact, there are some important things you really NEED to know before joining! Lazy Wealth System is a program that claims it can help people make $1,000 a day using a secret system that you can easily set up. They also claim that you don’t need any experience in online marketing to succeed with their system. In fact, you just need a laptop, tablet, phone, and an internet connection to make it work. In my opinion, this claim is unrealistic because there are NO shortcuts or secret system that can help you create a decent income online without any effort. That is why I don’t recommend this program due to the red flags I found on their sales page that, in my opinion, are deal breakers and make it a risky investment you should stay away from. I would suggest that you find another legit program that can teach or mentor, so you can properly start creating your own full-time income online. 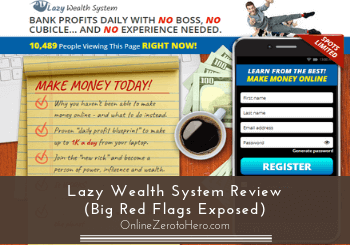 What is Lazy Wealth System and what does it offer? 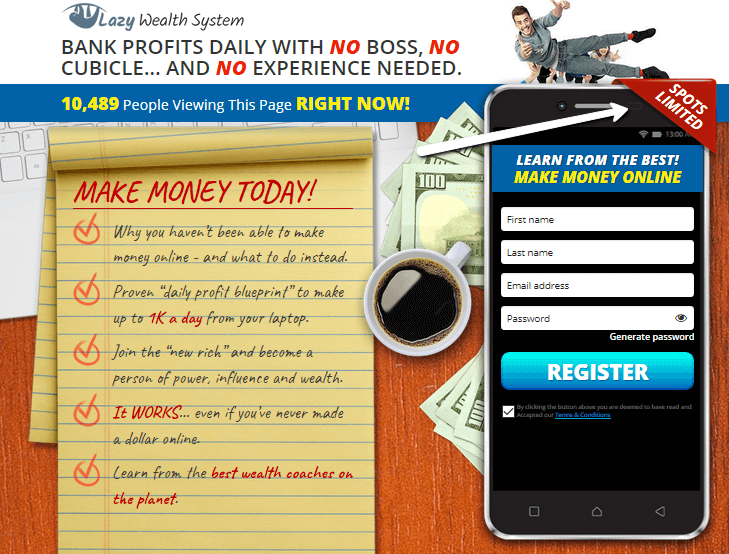 When first visiting the Lazy Wealth System site, it feels and looks the same as the other make online money programs I have reviewed in the past. It uses the same layout and attention-grabbing header text to keep the visitors on their sales page. One of the most outstanding claims on their page is the low requirement to succeed in their program. Some of the most common features of this program. In fact, you don’t need any experience in online marketing to succeed with their program. You just need a laptop, tablet, phone, and an Internet connection to make it work. It may appeal to some people especially those who want to make money online in the shortest possible time. But in my opinion, this claim is unrealistic because there are NO shortcuts or secret system that can help you create a decent income online without an effort. Like in any online endeavor, you’ll need to invest time, effort, and a bit of patience to succeed in this field. However, this is supposedly not the case with Lazy Wealth System, since they want you to believe that earning an income online is so easy – everybody can do it with zero effort. Basically, they want you to purchase their program, so you’ll have access to their membership site and their Lazy Wealth System app. You’ll also be able to access their training videos, eBooks, live professional support and 1-on-1 coaching call with their best wealth coaches. For those who are just starting out in online marketing and would like to earn a decent income online, it’s really amazing to see a claim that you can easily make money online without technical skills or prior experience. That’s why, when I saw that particular claim on the Lazy Wealth System site, I became skeptical and, in my opinion, it is just an overhyped claim. Based on my own experience as an affiliate marketer, no secret systems or workaround can make things magically easy for you. This is just one of the red flags that I’ve uncovered from their site and there several more that I think you should know about. When you visit their sales page, you’ll be prompted with a big font text saying, “MAKE MONEY TODAY” and a bunch of features they want to highlight on their program. It’s all just the good stuff without giving you a hint or a proper explanation of how their system works and your role once you join their program. It’s all about big earnings and rewards without giving you a hint on what this program is all about, so you’ll be clueless about what they are really selling. However, based on their sign-up page you can expect that you’ll be provided access to an app, some training videos, live professional support, and a 1-on-1 call. But that’s all the info you’ll get since you won’t know the real content of the course until you pay for their so-called activation fee. In my opinion, they should be providing more details about their system. How can you trust a program that doesn’t provide a proper explanation on what it really is and how it works? Although I understand that they just can’t give away all the details on their sales, they should at least provide some essential info, so we will know what to expect from their program. They are, for example, saying that you will learn from the best wealth coaches on the planet. Then they should at least give us a few names so we can see this really is true. If they really had some of the biggest names and coaches, my guess is also that they would have used these names as it would then have been a great reason to join. But you are not told anything about this or any other aspect of the program. So are you really willing to give your hard-earned money to a program that does not even tell you a bit about their system? You should take this red flag seriously before you purchase this program. On the sales page of Lazy Wealth System, you’ll notice the text “Spots Limited,” which means they want you to hurry before other people take all the spots. They are using fake scarcity tactics to encourage you to purchase their program. However, if you refresh the page or come back several days later, it’s clear that the notice will always be there so it is safe to say that they are using fake scarcity tactics to get you to join fast without taking the time to think about it. In my opinion, they are using false scarcity tactics to engage you and hopefully convince you to buy their product. This is another red flag for me because it only shows that they are NOT truthful and would be willing to use this kind of means to sell their product. So, if they are willing to use this tactic, what else would they do just to encourage you to purchase their program? I hope that you consider this red flag before you decide to join this program. Another significant red flag that I would like to point out is the claim on their page that 10,489 people are visiting the Lazy Wealth System website and you’re just one of them. They want you to believe that their program is popular. I find this hilarious because the number of views on their page is NOT real-time and not dynamically generated by an app. It’s clear that they just put it there to make an impression that their program is popular. You can check that by yourself – I bet it says the same number when you are visiting. How likely is it really that it will always be the exact same number of people visiting? In my opinion, they are using this tactic to gain credibility and to make you think that they are an authority in their field. Would you be willing to take your chances with a program that is using a fake counter to give an impression that they a credible opportunity you need to take advantage of? Again, this is another red flag that you should think about before you make your final decision.